A hunters’ organization called Idaho for Wildlife is seeking a five-year permit from the BLM to hold an annual predator-killing contest near Salmon. The organization held a similar contest in December. Contestants hunted on national forest land, following a court ruling that Idaho for Wildlife would not need a special-use permit for contestants to do so, but the organization did not seek to use BLM land at that time. During a 15-day public scoping period being held from Aug. 4-18, the BLM’s Salmon Field Office is seeking public comment on issues that should be addressed as it considers the current application for a special recreation permit. Registration for the contest would occur online or in person at a private business in Salmon. After applicants have registered, they would hunt for as many predators as they were able to kill within three days following the check-in. There would be no trapping for any species. A point system would be established and applied to different predators, and participants would compete for the most points. Coyotes, skunks, weasels, jackrabbits, raccoons and starlings are classified by Idaho law as predatory. 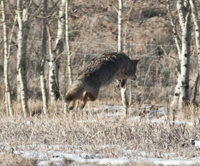 Predatory wildlife may be taken in any number year-round and at any time by holders of a hunting license. Wolves would also be a targeted species. All Idaho Fish and Game hunting rules would apply. The applicant would be responsible for implementing an outreach campaign in communities impacted by the event to notify private land owners and the recreating public of an additional competitive use that would be occurring on public lands. How would the proposed event impact economic and social values? How would the proposed project impact other recreational uses? How would the proposed action affect wildlife habitat and threatened species? After the scoping period and development of the EA, a 15-day comment period will be held in September and the public will have the opportunity to provide feedback. Information regarding the EA, including a description of the proposed action, can be found at www.blm.gov/epl-front-office/eplanning/nepa/nepa_register.do. Comments can be sent to Liz Townley, outdoor recreation planner, at BLM_ID_predatorhuntderby@blm.gov.